Fun cash register toy with LCD screen. Kids practice counting, addition and subtraction. The Teaching Cash Register is a great toy. 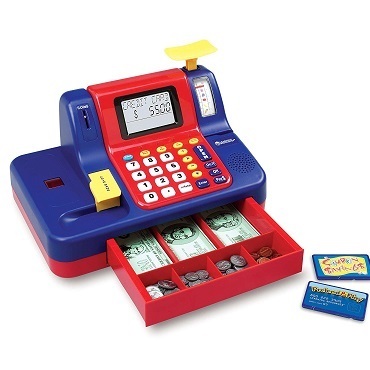 Children love to play with cash registers. And by playing store for hours, they also practice basic math. They count their coins and bills. They add and subtract numbers. They improve their math skills without realizing it. What's great about this toy is all the technology that it incorporates. It has an LCD screen that displays the tally and a talking scanner that generates prices just like in the supermarket. There is a coin slot where kids can insert the coin and the toy tells them what the coin they inserted was. The drawer opens automatically just like a cash register. They toy is highly interactive. There are math games with the talking scanner and the LCD screen that generate messages. Therefore, children can have fun while practicing their basic math skills. The toy is quite realistic. The bills are like actual size money and they are copies of real dollar bills. Children can also pay with credit card. Sometimes they toy says that the credit card has been declined. Younger children can also enjoy this game: the toy makes sounds, has lights and talks. Younger children can really have a blast ring the toy and making it talk even though they are still too young to count they money (even though some young children do even learn to count money). The volume can be adjusted if the toy is too loud. And it automatically shuts off so that batteries don't run out too fast. By the way, you need to get batteries for this toy (3 C batteries) as they are not provided.